"Despite efforts to increase fiber intakes, fiber intakes continue to be deficient," according to Joanne Slavin, PhD, RD, a professor in the department of food science and nutrition at the University of Minnesota Twin Cities in St. Paul. As a result, dietitians are bound to encounter clients and patients reaching for supplements to fill the fiber gap instead of meeting daily requirements through foods. Kristi King, MPH, RDN, LD, CNSC, a spokesperson for the Academy of Nutrition and Dietetics and senior dietitian specializing in gastroenterology at Texas Children's Hospital in Houston, says it's most common for people to take fiber supplements because it's an easy way to remain regular when they aren't consuming adequate amounts of fruits, vegetables, and whole grains. Consumers also may buy fiber supplements to help lower cholesterol, manage weight, or stabilize blood sugar. Regardless of their motivation, fiber supplements are a popular way for clients to boost intake, and they're not going to stop buying them any time soon. Thus, it behooves dietitians to be knowledgeable about the many types of fiber and familiar with the variety of products available so they can educate clients and answer questions. In this article, Today's Dietitian (TD) scours the dietary supplement aisles to give you a breakdown of some of the most common fiber supplements on the market, the types of fibers they contain, and their indications. Not surprisingly, all three RDs TD spoke with recommend reaching for whole foods first to meet one's fiber needs. As King points out, "High-fiber foods often contain other important vitamins, minerals, and antioxidants that our body needs, so you're getting more bang for your buck. However, people may need supplements to help meet their goals, and that is OK."
But are the benefits of fiber consumption the same from food vs supplements according to scientific evidence? Per Slavin, "All fibers have health benefits, [such as improved] bowel function, lipid lowering, glucose control, satiety, blood pressure, and others." On the basis of epidemiologic studies that investigated fiber intake from whole foods, "Fiber intakes greater than 25 g a day protect against cardiovascular disease," Slavin says. As far as fiber supplements or isolated fibers are concerned, Slavin says they've been tested and found to have benefits, such as those listed above. All the same, Katie Ferraro, MPH, RDN, CDE, founder of Ingrain Health, Inc, a nutrition communications consulting company in San Diego, and author of the blog Fiber Is the Future, finds that more often than not people look to fiber supplements primarily to help them resolve issues with constipation and irregularity. She counsels such clients to hold off buying supplements until they've participated in what she calls a seven-day 3-2-1 challenge: to "eat three pieces of fruit, drink two liters of water, and have either one serving of oatmeal or bran-containing food each day for one full week." Ferraro says when her clients adhere to this food-based approach, much of their gastrointestinal discomfort related to constipation and irregularity is alleviated, adding that those who add physical activity experience an even greater benefit. • Inulin usually is extracted from chicory root, although it's found in many fruits and vegetables, according to the Natural Medicines Database. It has been found to improve mineral absorption and may be effective in lowering triglycerides.4 Considered a prebiotic, when inulin is fermented in the colon, it promotes production of the beneficial gut bacteria Bifidobacteria. Fructooligosaccharides are shorter chains of inulin that have prebiotic activity.4 According to the Natural Medicines Database, there's preliminary evidence that fructooligosaccharides may protect against colon cancer. • Methylcellulose is a synthetic, soluble bulk-forming laxative derived from cellulose. Primarily, it's used to treat constipation, but it also may help relieve some forms of diarrhea.5 In addition, because methylcellulose isn't fermented in the colon, it's well tolerated. • Psyllium is most celebrated for its role in lowering LDL cholesterol and improving the LDL:HDL ratio.7 Psyllium also slows carbohydrate absorption, thereby decreasing blood glucose levels.8 This soluble fiber is derived from the seeds of the Plantago plant and is effective for treating constipation, per the Natural Medicines Database. 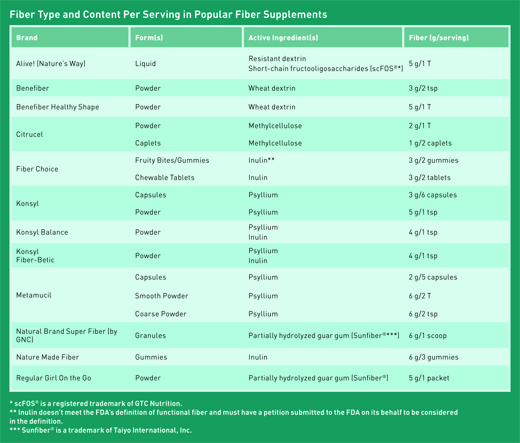 See table for specific products containing each of these fibers. Although there is no Tolerable Upper Intake Level, increased fiber consumption may elicit undesirable gastrointestinal effects, which can be a concern with isolated fibers from supplements. This of course depends on the type of fiber and quantity consumed. For instance, inulin is fermented in the large intestine more quickly than some other fibers resulting in increased gas production and bloating.9 Thus, inulin is better tolerated in lower doses (10 g to 15 g/day).11 Conversely, wheat dextrin is well tolerated in higher doses (30 g to 45 g/day) as it is slower to ferment in the gut.9,10 As experts in nutrition, dietitians are uniquely poised to educate clients about varying fibers and ultimately assess whether supplemental fiber is indicated to meet their individual needs. 1. US Department of Health & Human Services. 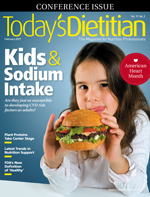 Dietary Guidelines for Americans 2015–2020: Eighth Edition. http://health.gov/dietaryguidelines/2015/guidelines/. Published January 7, 2016. 2. Hoy MK, Goldman JD; US Department of Agriculture, Agricultural Research Service. Fiber intake of the U.S. population: What We Eat in America, NHANES 2009–2010. https://www.ars.usda.gov/ARSUserFiles/80400530/pdf/DBrief/12_fiber_intake_0910.pdf. Published September 2014. 3. Food labeling: revision of the nutrition and supplement facts labels. Regulations.gov website. https://www.regulations.gov/document?D=FDA-2012-N-1210-0875. Published May 16, 2016. 4. Dahl WJ, Stewart ML. Position of the Academy of Nutrition and Dietetics: health implications of dietary fiber. J Acad Nutr Diet. 2015;115(11):1861-1870. 5. For health professionals. FiberFacts.org website. http://fiberfacts.org/for-health-professionals/. Accessed December 4, 2016. 6. Giannini EG, Mansi C, Dulbecco P, Savarino V. Role of partially hydrolyzed guar gum in the treatment of irritable bowel syndrome. Nutrition. 2006;22(3):334-342. 7. Petchetti L, Frishman WH, Petrilo R, Raju K. Nutraceuticals in cardiovascular disease: psyllium. Cardio Rev. 2007;15(3):116-122. 8. Gibb RD, McRorie JW Jr, Russell DA, Hasselblad V, D'Alessio DA. Psyllium fiber improves glycemic control proportional to loss of glycemic control: a meta-analysis of data in euglycemic subjects, patients at risk of type 2 diabetes mellitus, and patients being treated for type 2 diabetes mellitus. Am J Clin Nutr. 2015;102(6):1604-1614. 9. Slavin J. Fiber and prebiotics: mechanisms and health benefits. Nutrients. 2013;5(4):1417-1435. 10. Slavin JL, Savarino V, Paredes-Diaz A, Fotopoulos G. A review of the role of soluble fiber in heath with specific reference to wheat dextrin. J Int Med Res. 2009;37(1):1-17. 11. Bonnema AL, Kolberg LW, Thomas W, Slavin JL. Gastrointestinal tolerance of chicory inulin products. J Am Diet Assoc. 2010;110(6):865-868.